From the moment the audience walks in, they are unknowingly watching the show. The performance starts ten minutes prior to the house lights’ dimming. It is clear that every single moment of this play is carefully and thoughtfully staged by director Gregory Peters. Once the lights shift and the official proceedings of the evening begin, we meet Maestro Signeretti (Nick Freed). This eccentric and self-proclaimed genius is a composer whose fame stems mostly from his failed attempt to destroy the planet via a musically induced violent cataclysm. He and his manservant (Derik Marcussen) relate the details of the Maestro’s life to a reluctant audience of one: the Maestro’s gardener (Sean McGill). These three are joined on stage by three ladies who play an ensemble of characters, as well as the love interests of Signeretti’s life. Julia Stemper, Jessica Saxvik and Sara Jean McCarthy each carry a section of the show, but perhaps more importantly, they act as puppeteers. 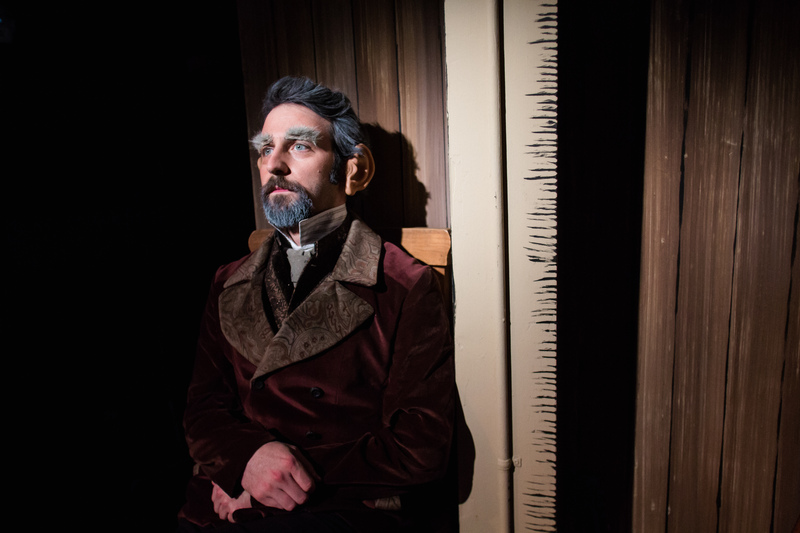 The staging of this show is limited to the confines of a single room which scenic designer Katie-Bell Springman created to look somewhat cartoonish, and somewhat period, although just what period one can’t pin down. That limited space is brilliantly filled with often frenetic action, and one overwhelmingly large picture window. The Plagiarists at Jackalope Theatre’s Frontier Storefront, 1106 Thorndale, (800) 838-3006, theplagiarists.org, $15. Through November 21.